In case you need a bigger container for shipping your baked cookies than this half gallon square pail, you might want to consider the ¾ gallon square EZ Stor bucket pail and lid. Coming in 12 packs, ¾ gallon EZStor plastic containers are equipped with lids including tamper evident tear tab strips. It's white in color and approved by FDA, so it's safe to contain food products. Unlike the half gallon square pail, this ¾ gallon square bucket has a handle with it for easy carrying. 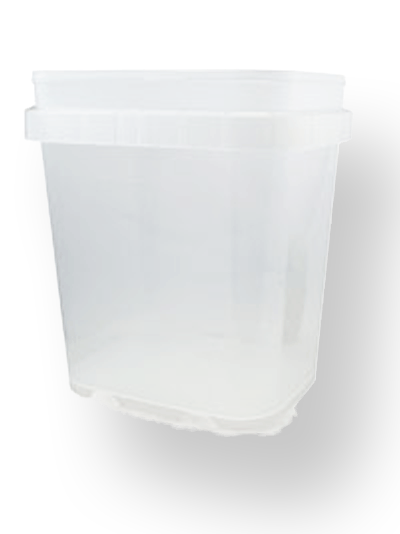 So if you need to be mobile with the pail, it is not a problem with ¾ gallon square EZStor Bucket Pail.